WASHINGTON, DC, August 13, 2013 (ENS) – The World Bank has approved US$340 million for the long-planned Regional Rusumo Falls Hydroelectric Project, which will generate power for residents of Burundi, Rwanda and Tanzania. While local officials eagerly anticipate the power scheduled to start flowing in 2017, river advocates say ecosystem impacts of the project have not even been evaluated. The 80 megawatt hydroelectric power station in Rwanda will dam the Kagera River. It will be located at Rusumo Falls on the border with Tanzania, near the town of Rusumo, 117 kilometres (73 miles) southeast of Kigali, the capital and largest city in Rwanda. Transmission lines will extend from the power station to Gitega in Burundi, Kigali in Rwanda and Nyakanazi in Tanzania. This project is the first operation under the World Bank Group Great Lakes Regional Initiative inaugurated by World Bank Group President Jim Yong Kim during his historic joint visit with UN Secretary-General Ban Ki-moon in May. The overall project cost is US$468.6 million and its 80 megawatt generation capacity will boost reliable power supply to the electricity grids of Burundi, Rwanda and Tanzania, reduce electricity costs, promote renewable power, spur job-led economic development and pave the way for more dynamic regional cooperation, peace and stability among the countries of the Nile Equatorial Lakes sub-region in east Africa. The World Bank financing of a total US$340 million – US$113.30 million to each of the governments of Burundi, Rwanda and Tanzania comes from the International Development Association, the World Bank’s fund for the poorest countries. Lack of access to electricity is a defining constraint in the region. Only four percent of the population in Burundi has access to electricity, corresponding numbers for Rwanda and Tanzania are 13 and 15 percent respectively. All three countries will benefit from job created by construction and installation activity associated with the power plant. Murayire Protais, the mayor of Rwanda’s Kirehe district, recently told Nile Basin government officials who visited the project site that the people of his district are looking forward to electricity from Rusumo Falls as only eight percent of the households in Kirehe district have access to electricity. “We have been in darkness for a long time and have waited for the project for a long time. I pledge to be close to the project activities as much as possible,” said Mayor Protais. The ministers in charge of water affairs in Rwanda and Burundi also expressed support for the project. “The project has been awaited for more than 20 years. I congratulate all those who have been working hard to ensure that studies are complete. We are beginning to see light at the end of the tunnel. I call upon Members of Parliament and development partners to support the project,” said Jean-Marie Nibirantije, Burundi’s Minister of Water, Environment, Land Management and Urban Planning. “This project is very important to us in Rwanda and the region at large. We are in dire need of power. We should now combine our forces to ensure that the project translates into an asset that is beneficial to our populations,” said Rwanda’s Minister of Natural Resources Ambassador Stanislas Kamanzi. The bank says that by choosing a run-of-the-river option to reduce social and environmental impacts, the participating governments have demonstrated careful and responsible decision-making. “The Rusumo Falls Hydroelectric Project takes a regional approach to tackling Sub-Saharan Africa’s power crisis, providing low-cost, clean, renewable energy to people in Burundi, Rwanda and Tanzania,” says Jamal Saghir, World Bank Director for Sustainable Development in the Africa Region. “The new power plant signals the Bank’s commitment to keeping the lights on across the African continent, necessary for achieving growth, ending poverty and boosting shared prosperity in the region,” said Saghir. While other parts of Sub-Saharan Africa are experiencing high growth rates, countries of the Great Lakes sub-region have had high levels of poverty and low levels of key services such as access to electricity. Yields from agriculture also are typically quite low. Approval of the Regional Rusumo Falls Hydroelectric Project is part of the World Bank Group’s development approach to the region – to increase power generation and interconnectivity to take advantage of low-cost and renewable sources of hydropower and shared infrastructure development. But the U.S.-based rivers advocacy group International Rivers is critical of the project, maintaining that the World Bank’s return to funding big dams after 20 years of backing small and medium hydro projects is counterproductive and environmentally damaging. “The big, bad dams of past decades are back in style,” writes Peter Bosshard on the International Rivers blog. The bank’s safeguards information sheet lists expected impacts that include the flooding of 5,280 hectares of agricultural lands and 20 hectares of developed lands along the Kagera and Ruvubu Rivers and around Lake Rweru. Affected people number between 5,200 to 6,700 households, or roughly 30,000 to 40,000 people. 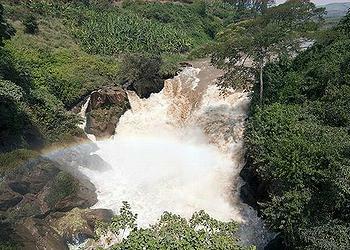 Upstream, the Rusumo Falls hydropower project would flood wetlands marsh habitat around and upstream from Lake Rweru. International Rivers says part of this area may be designated wetlands of international significance under the Ramsar Convention. Downstream, Rusumo Falls hydropower project may alter the flow regime of the Akagera National Park in Rwanda, the rivers advocacy group warns. The transmission line associated with the project, funded by the African Development Bank, may also impact natural habitats. According to the World Bank, close to US$32 million has been allocated for mitigation projects, including resettlement and local area development programs. The environmental impact assessment for the hydropower project includes a section on the project’s cumulative impacts and impact interactions relative to other projects in the basin, including other dams, transmission lines, a railway project, and a border post project. But World Bank officials say the project will strengthen the capacity of the Nile Equatorial Lakes Subsidiary Action Program and its emergence as a regional center of excellence. This program promotes investments in power development and trade, water resources management, management of lakes, fisheries and watersheds, as well as agricultural trade and productivity.